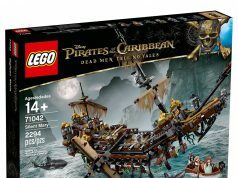 Last month at the 2017 New York Toy Fair, LEGO revealed the new LEGO Pirates of the Caribbean: Dead Men Tell No Tales The Silent Mary (71042). We got a first good look at The Silent Mary during the Super Bowl TV spot where it showed some of the details of the ship as well as some of the accessories like the ghost sharks. 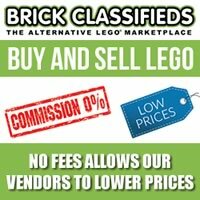 The 2,294 piece set will retail for $199.99 and will be available for LEGO VIP members on March 17 and to the general public on April 1. 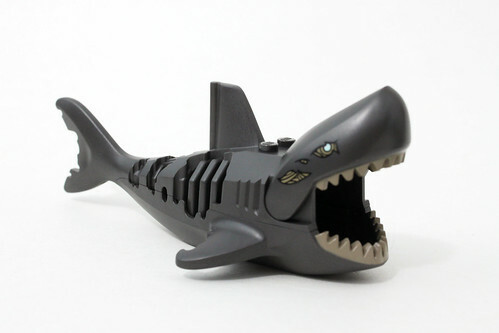 The contents of the box include 15 numbered bags going from Bags 1-13, one unnumbered bag with the masts and sharks, a bag with the fabric sails, and the instruction booklet. 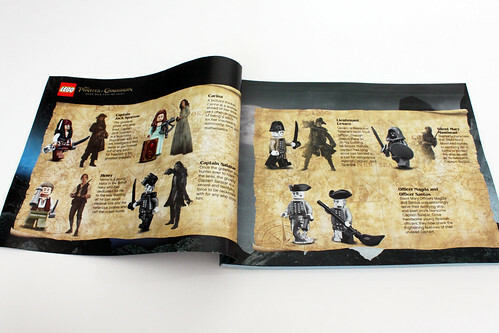 In the front of the 263 page instruction book, there are some short biographies of a few of the characters of whom the minifigures represent. There’s also a short description of The Silent Mary itself along with some translations in French and Spanish. 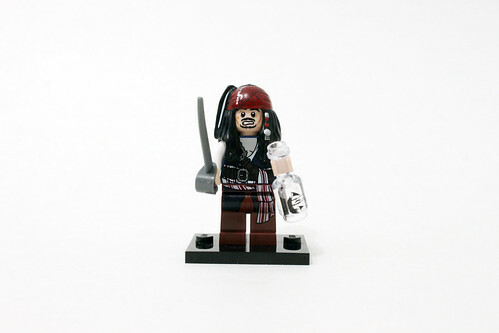 There are eight minifigures in the set which include Captain Jack Sparrow, Henry, Carina, Lieutenant Lesaro, Captain Salazar, Officer Magda, Officer Santos, and the Silent Mary Masthead. 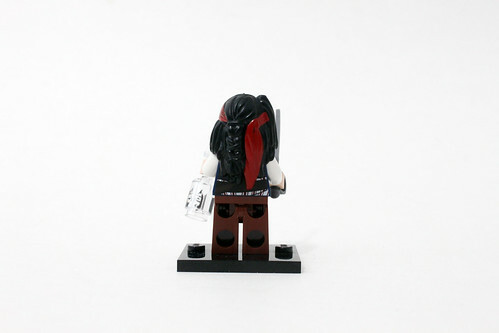 Captain Jack Sparrow has some new printing for his torso. Although it looks similar to the previous versions, there are some slight differences with the new one. On both sides of the torso, the blue overshirt now has some decorative designs on it and the belts have more detailing on the straps. The brown legs also has some printing of the shirt as well as part of the striped scarf that goes around the waist. Jack has a double-sided head with a confident look on one side and a scared expression on the other. There’s even a little X scar on both sides of the face which is exclusive to this set. The hair mold appears to be the same as before but there is some new printing especially on the red bandana. 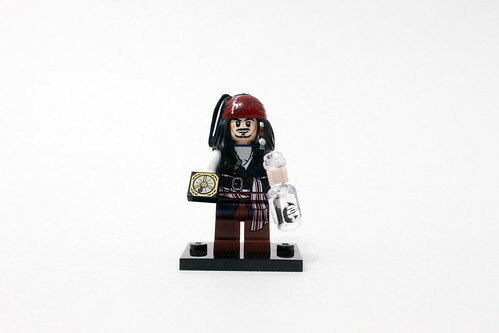 His accessories include a sword, a clear bottle with printing of a ship which represents a ship in a bottle, and a nice looking black compass. Henry has on a pretty traditional looking outfit with a gray shirt and a brown vest. The vest has a pattern on the front and a differernt pattern on the back of the torso. The legs are just plain olive green. Henry has a double-sided head with confident smile on one side and a scared look on the other. The hair piece is a slicked back ponytail. 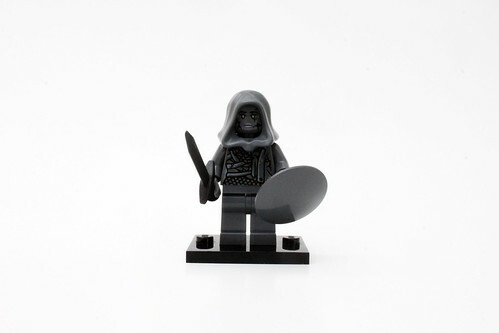 His accessories include a sword and a monocular. Carina has on a light aqua colored dress with some corset straps on the back of the torso. She also has a double-sided head with a happy smile on one side and an angry expression on the other. 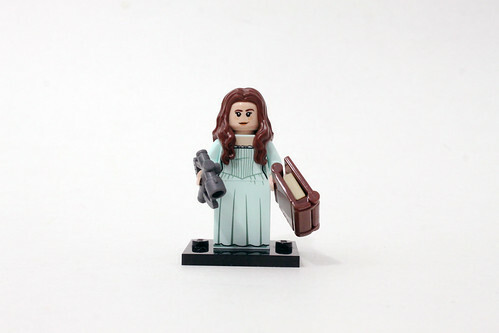 Her accessories include a sextant and a printed Galileo Diary with a printed tile of astronomy notes which suggest they could be clues to the trident of Poseidon. 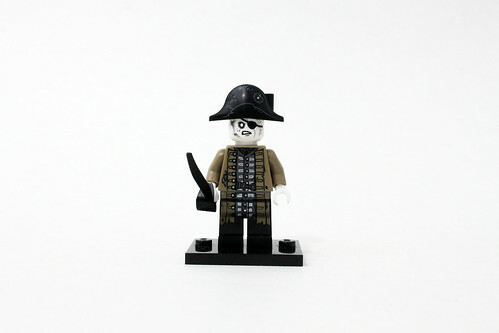 Lieutenant Lesaro wears a tan outfit and is the only ghost pirate to have color on their uniforms. He has a single-sided head with an angry look with a patch over one eye. 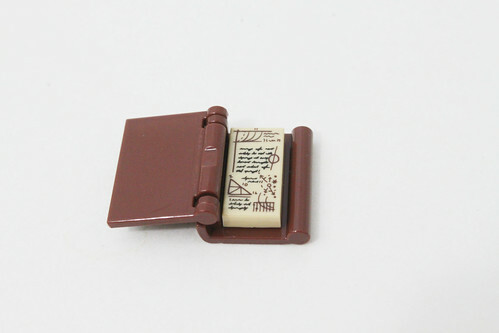 Lesaro’s hat mold has been used before but there’s some printing on it that makes it exclusive. 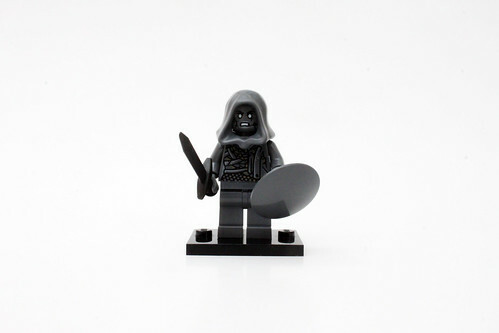 His accessory is a black sword. 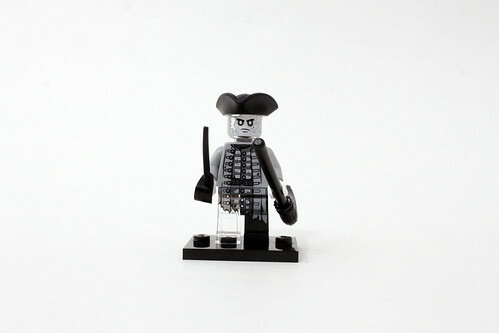 Captain Salazar has a similar outfit as Lieutenant Lesaro but his is black and white and has some slight printing differences such as the insignia on the torso. 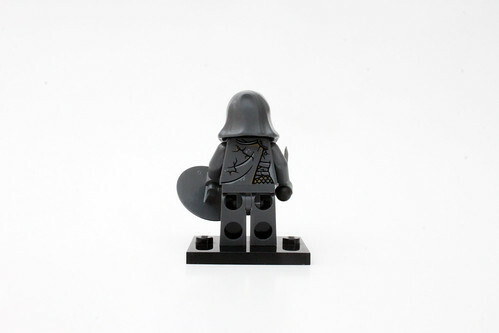 He also has a black epaulette that goes between the head and torso. 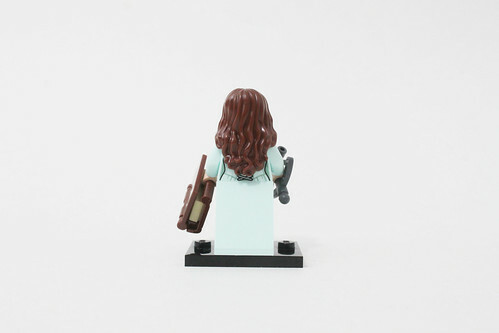 The head is a clear piece with some white printing for the face and back of the head. 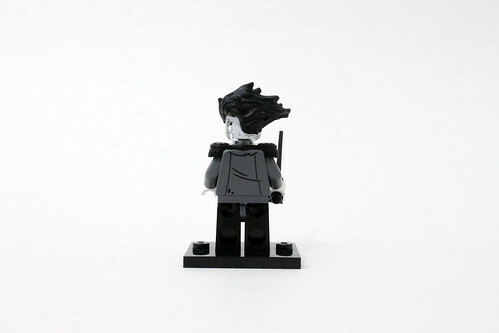 The hair piece is new showing off his long flowing hair. 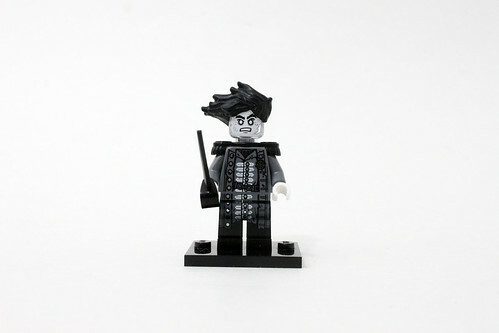 I have a feeling that this new hair will be sought for after this set is released. Officer Magda has on a similiar outfit as the other ghost pirates. 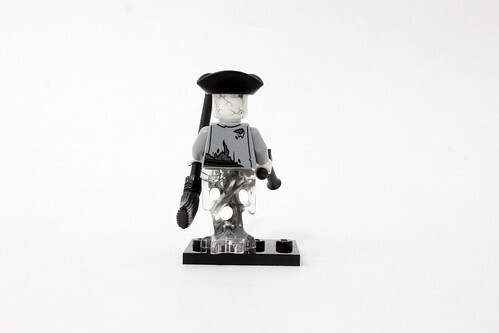 The transparent ghost leg has been used before first in LEGO Ninjago and it eventually made its way to the Series 14 LEGO Collectible Minifigures (71010) and the gray version is the one we have here. Like Lieutenant Lesaro, Magda has a solid white head with an angry look on it. The tricorn hat that he wears makes its first appearance since 2011. 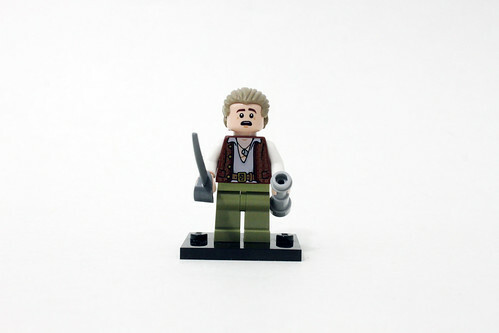 His accessories include a flintlock pistol and a broom. 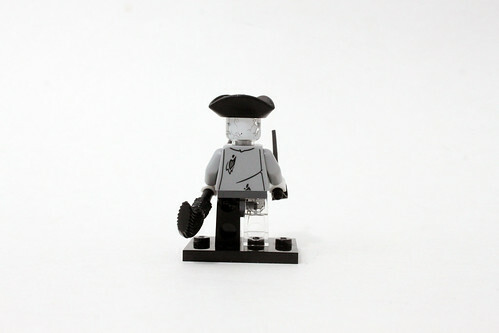 Next up is the last ghost pirate minifigure in the set with Officer Santos. Again, he has a really similar outfit as the other ghost pirates but there’s subtle differences in it that makes it exclusive to that character. The legs have one leg that is translucent to give it a ghostly effect. 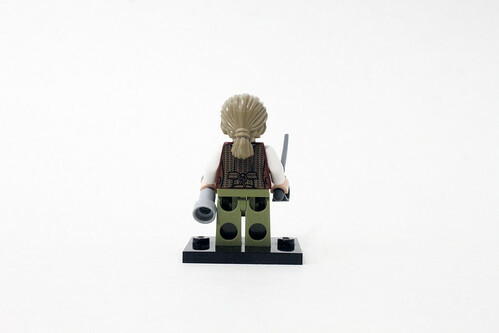 The head is similar to Captain Salazar where it is clear with white printing on the front and back. 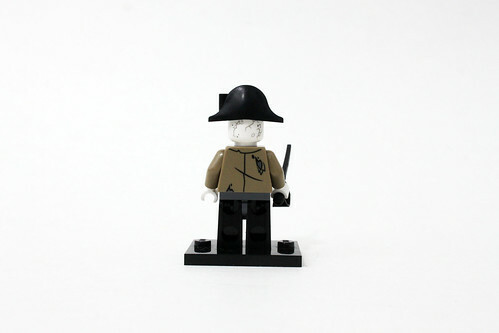 Santos also wears a tricorn hat and has a sword and broom as accessories. 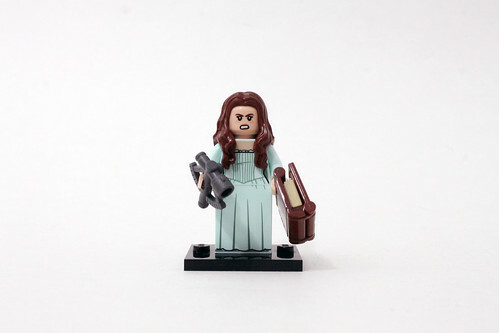 Finally for the last minifigure, we have the Silent Mary Masthead. The pirate ship is named after her and according to the biography in front of the instructions, she comes alive to protect the ship. The majority of Mary is dark gray with speckles of tan on the torso and the head. She has a double-sided head with a stoic expression on one side and an angry look on the other which represents her normal and battle looks, respectively. 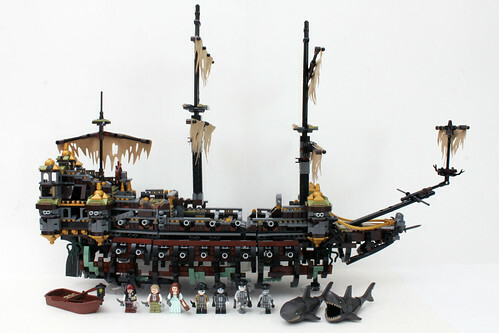 The minifigure stands on the front of the Silent Mary. 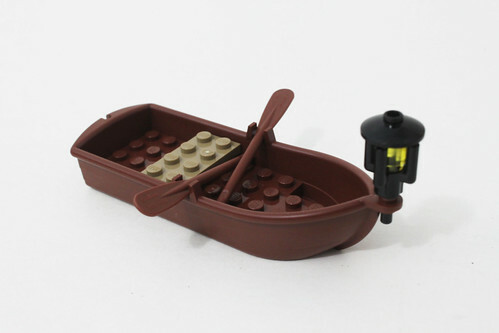 The first part of the build is a little rowboat for the crew of Jack, Carina, and Henry that has a lantern in the front. There’s nothing much going on here. 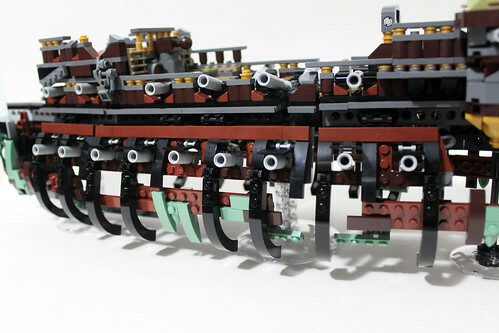 The build of the Silent Mary is separated into different sections for the bags. 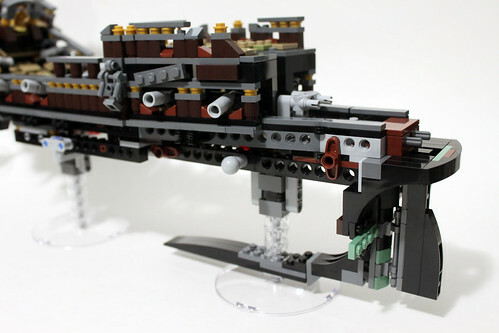 The first bag creates the frame of the ship which is made up of mostly Technic beams. In the bow area, there are four flex joints that are used for the lifting feature that the ship has which I’ll get to later. The second bag and third bags add more details and stability to the bow area. 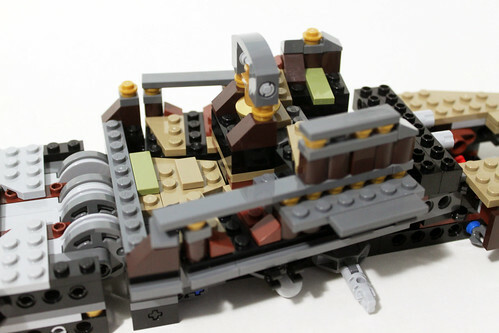 Here we start getting some dark tan, pearl-gold, and olive green elements which are used throughout the ship. One feature that stands out here in the bow area is the bell in front of the joints. The bell uses a fairly rare metallic gold dish piece that looks pretty good next to the dark gray and pearl gold parts. 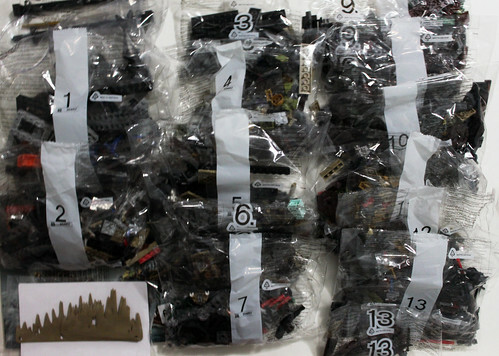 The fourth bag is where a lot of the main details start to show up. 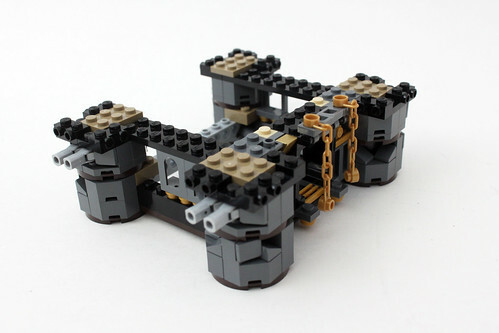 First are the turrets and the domes on the top and bottom of the ship with the bottom one being inverted using a Technic pin that goes between the round plates. 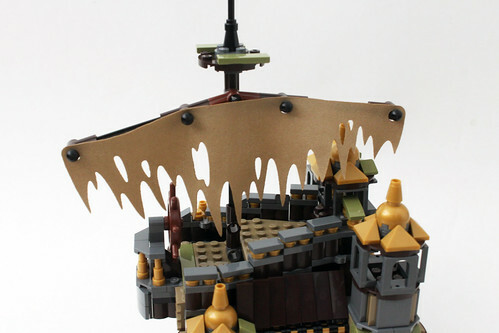 On the top turrets, it’s a similar build with the pearl-gold slope pieces but it also has some new 2×2 concave slope bricks in olive green. Finally we have some new pearl-gold hoses that give the form of the bow. 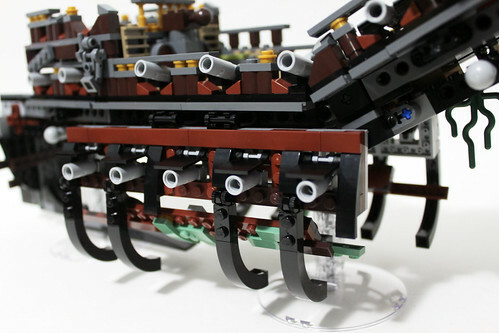 The fifth bag is used for the Silent Mary’s main deck. 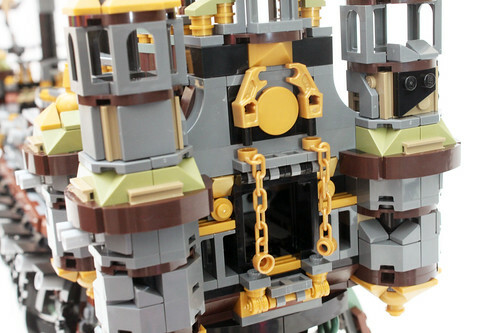 There are some plates and a dark tan grid plate that covers up the hole with some olive green tiles used for detailing. Here we also have seven brick-built cannons that are on 1×2 plates with hole so they can be raised and lowered. 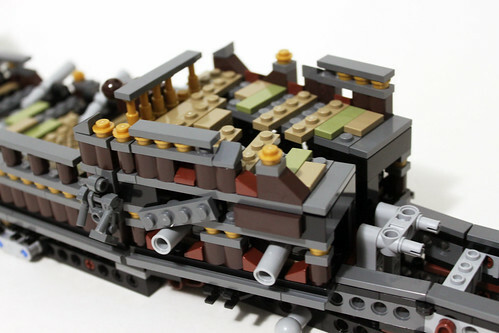 Next up, we build the gundeck of the Silent Mary. 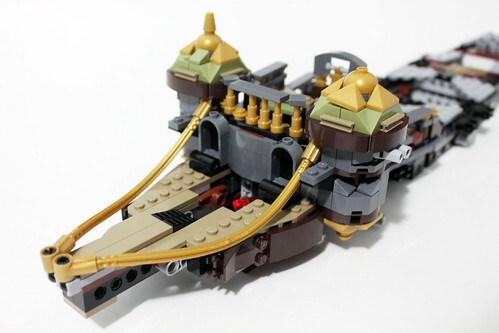 Each side consists of two more cannons and are attached to the ship on the jumper plates. 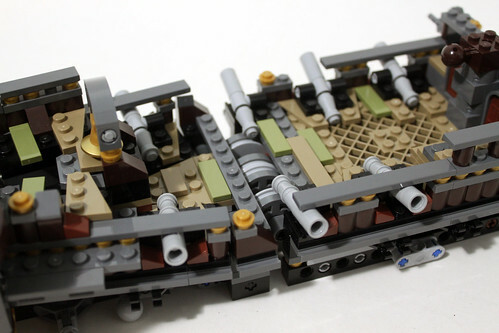 To further keep them in place, there are some hinged plates that connect to the rest of the ship. Bag 7 give a nice change up to the build. 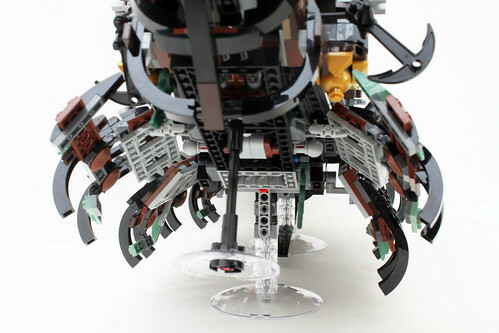 Here we have the three stands that go on the bottom and are connected via Technic pins. The front uses a new 6×6 transparent dish while the middle and back ones use 10×10 dishes. 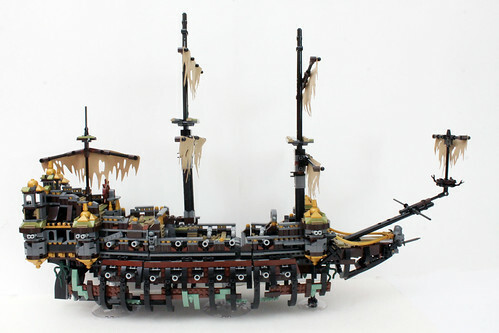 The annoying part here is that you have to somehow lay the ship down to attach them on. In the same bag, you also have the back of the Sileny Mary as well as the rudder. There’s some sand green parts in this area to give the look of some algae growning on the ship. There’s also some seaweed pieces on the sides. 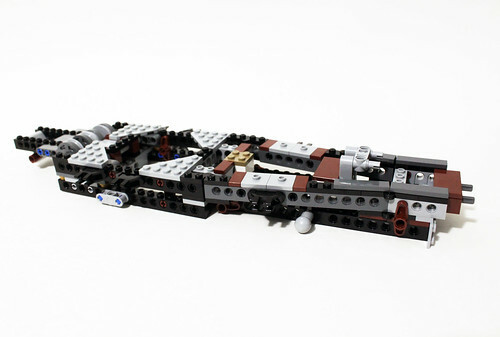 Bags 8 and 9 are essentially used to build the ship’s skeletal hull. 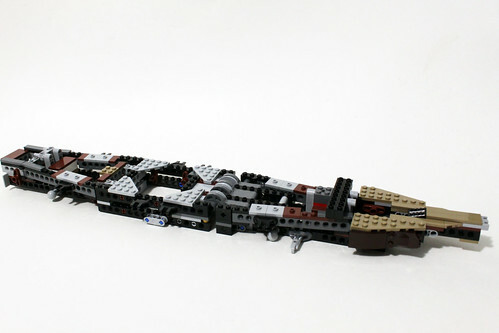 They are attached to the ship using 1×2 modified plates with bar which allows the hull to open up. There are a lot more cannons that are coming out of the gunports. Bags 11 and 12 are used to build the ship’s quarterdeck. This area has four more turrents surrounding it similar to the build in the bow area. Towards the back, there’s a door to the Salazar’s cabin with some windows on the sides. 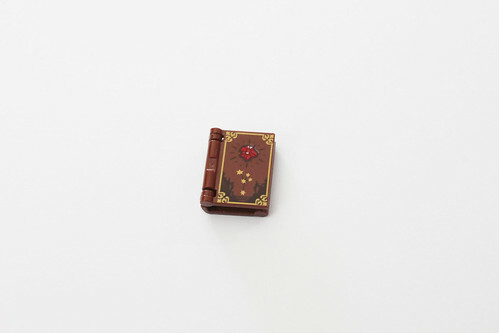 There’s also some pearl-gold details that surround the area like the chains, telescopes, and 1×1 clips. The Spain coat of arms is right above the cabin’s door which uses a 2×2 round tile and two robot arms. 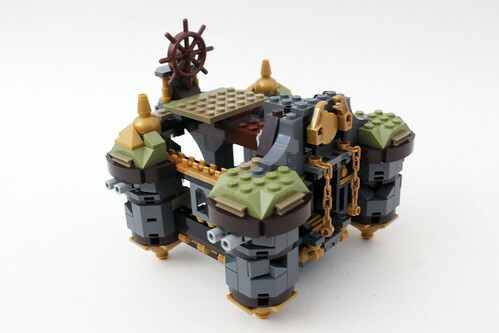 Here we also have the mizzenmast that goes right behind the steering wheel. The tattered sail that is used is the smaller of the two that are in this set. 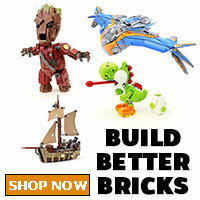 It uses the same soft fabric that are used more recently with the Super Hero capes. It is attached to the mizzenmast using a ball pin. 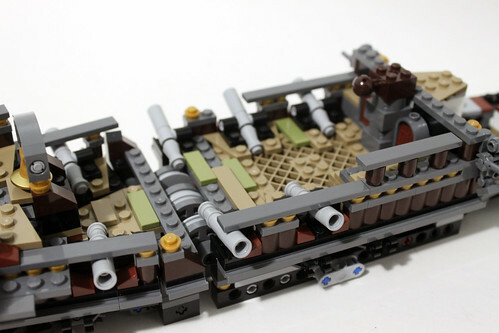 The whole quarterdeck is connected to the main ship via pins that goes goes both ways for stability. Once it goes in, there’s a good feeling that overcame me knowing that it’s almost completed. 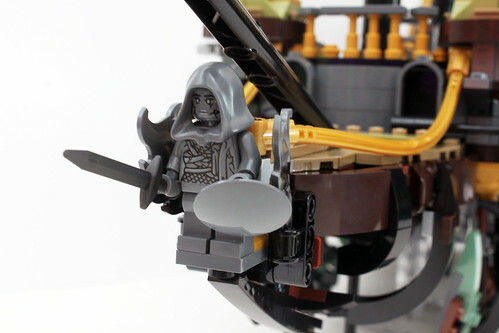 For the first part of the last bag, we build the masthead where the Silent Mary minifigure stands as the ship’s figurehead. Surrounding her are a couple of black wing pieces to give the area more detail. Behind that, there are a couple of anchors as well as the long bowsprit that attaches to a pin that was set early in bag 2. Another small sail piece is the spritsail that goes on the end of the topmast at the end of the bowsprit. 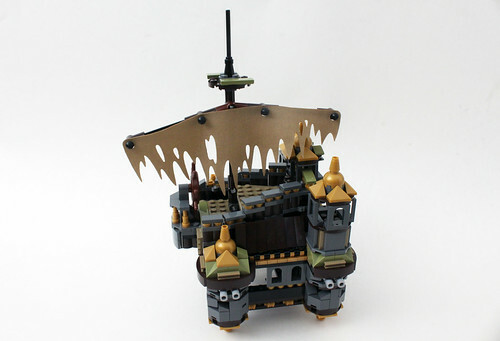 Finally we have the foremast and the main mast which are the exact same builds. The foremast goes in the bow area before the bell while the main mast goes on a ball socket brick right above the cannon. The play feature here is that the main mast is able to collapse over either side due to it being on a ball joint. 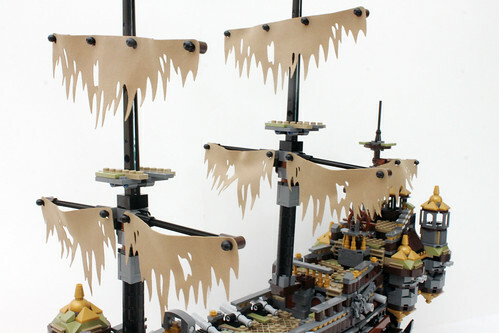 I will note that the counts are off for the sails in the back inventory of the instructions. There are actually five of the smaller sails and three of the large ones. The last thing we put on the ship are the ghost sharks. 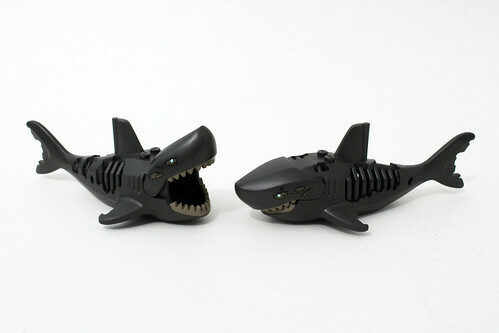 Let’s take a look at the sharks for a second. 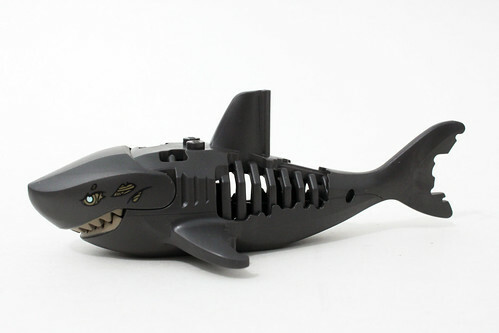 They are the newer shark mold but instead of it having just a full mold, there are holes in it on both sides to show it decaying and rotting away. The printing on the head shows it with early stages of rotting on the eyes and behind the eyes. 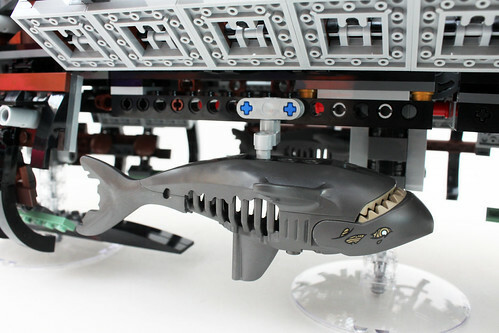 The sharks are able to attach below the hull using a Technic pin. 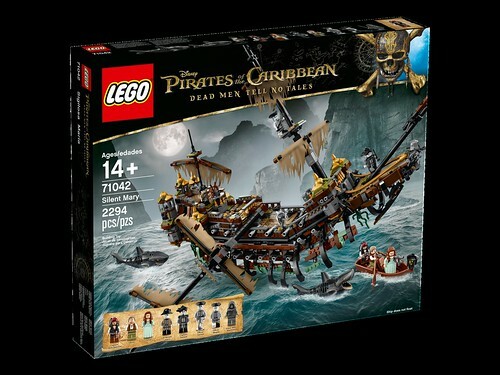 Overall, the LEGO Pirates of the Caribbean: Dead Men Tell No Tales The Silent Mary (71042) is a pretty cool build but I will say that it might disappoint some fans, especially the ones that collect ships. 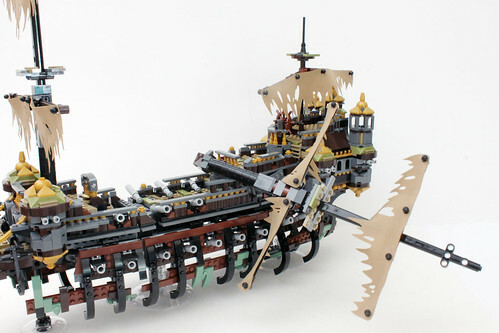 The Silent Mary is a ghost ship in the movie and I applaud LEGO for producing something that goes against the grain. I do like the look of the ship even though it’s missing an actual hull but it doesn’t look too bad from the side. The hull ribs is gimmicky but it works well. The main feature of the ship is that the bow is able to lift up to give the appearance of it ready to attack an enemy vessel. There are lots of little details on it that I like especially in the quarterdeck area. 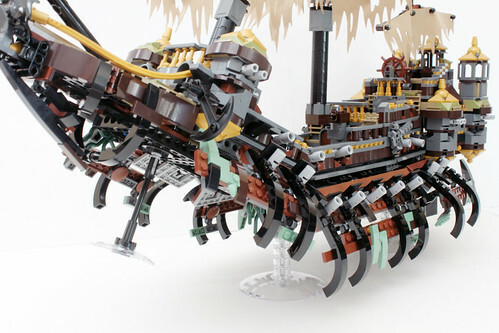 I also like that there are stands included to display the Silent Mary as there’s no way for it to sit by itself because the rudder is the lowest part of the ship. 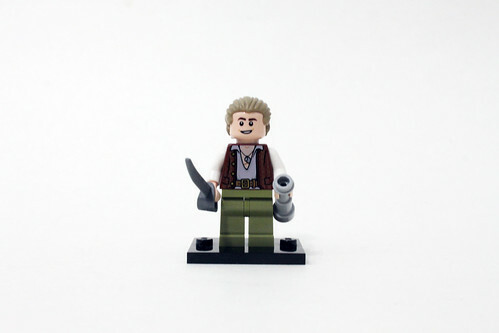 The minifigure selection is great with new printing for Jack Sparrow and all of the new characters but the ghost pirates shine here. 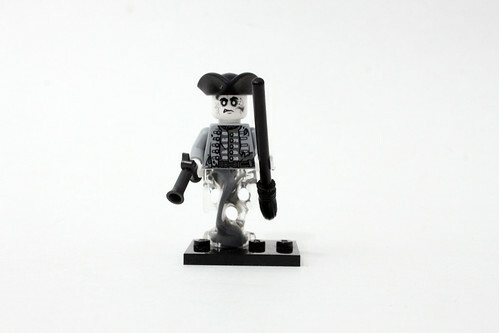 As I mentioned before, there are slight variations on each ghost pirate to make them unique. 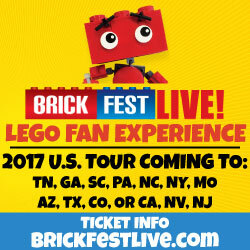 Now on to some things that I didn’t like. 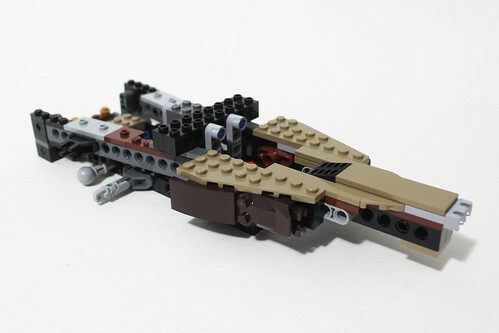 I carefully handled the ship when transporting it around but it is fairly fragile especially around the rib area. 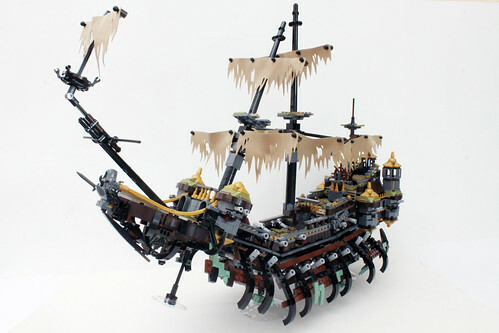 There’s nothing much to hold on to unless you reach all the way underneath to the Technic beams. 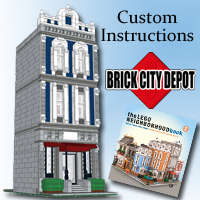 I have a feeling that most who purchase this set will have it more for display than to play with it. 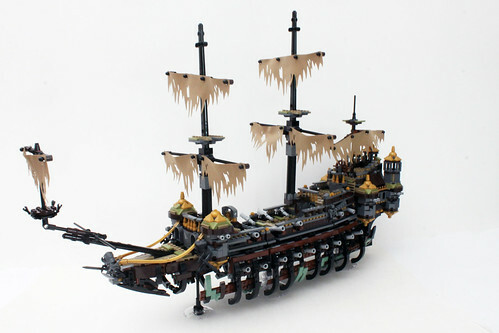 Again, the Silent Mary (71042) will be available starting this week on March 17 for LEGO VIP members and for the general public on April 1.